First of all, we have received some unexpected and much needed rain and this has brought forth a wide variety of life in the area (even more than usual!). The bush has started to turn a refreshing shade of green, with new shoots emerging on the recently burnt areas. This has made for fantastic scenery, coupled with the stunning animals which have been showing off for us these past few days. Every day here in the middle of the African bush is a special one as each day brings new, unpredictable sightings along with more knowledge...which leads to a better understanding of how nature works. 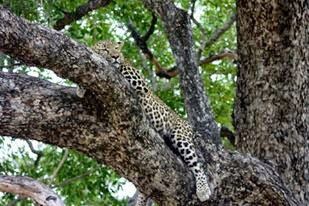 We then came across a scene in which a very young male leopard had stored an impala kill in a massive Jackalberry tree. He had been feeding on this along with his mother for the past two days and he was panting from gorging himself on his well-deserved meal. 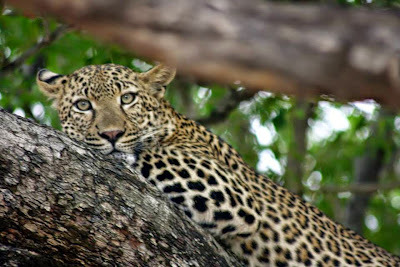 We found him lying comfortably with his limbs hanging either side of a large branch with his kill not too far away on a lower branch. This was an absolute treat as we could view the gorgeous cat only metres away from us without any obstructions. We then realised that his mother was lying in a patch of dense vegetation in close proximity to the tree, which was even more of a bonus. Scanning the surroundings of the open area, we saw a couple of old buffalo bulls which were also very close to the leopard. They showed interest for a moment or so then remained unfazed with the predators nearby and carried on with their normal behaviour. After a couple of minutes, something appeared in the far distance across the plains…a lion! 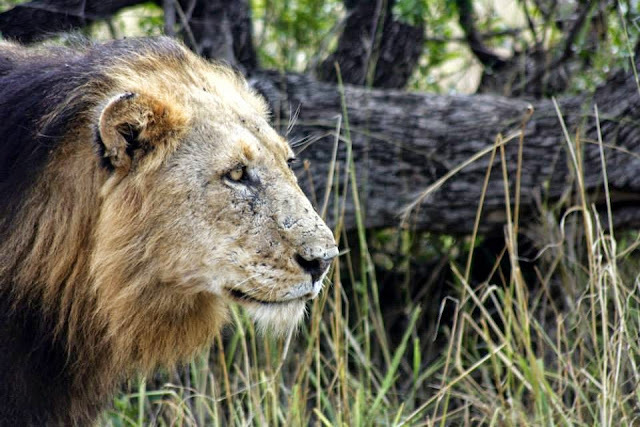 We could not believe our eyes, as we looked through our binoculars to see a dishevelled and hungry-looking male lion which appeared out of nowhere. We decided to drive closer to inspect the scruffy cat as he sat staring into the distance towards the leopard kill. We stopped near the lion, expecting him to remain lazy and lethargic, as most lions do during the day...until the wind direction changed and he got a whiff of a much needed meal! He immediately got up and walked past and behind our vehicle (as if deliberately using it as cover) and made his way across the open area towards the leopards. 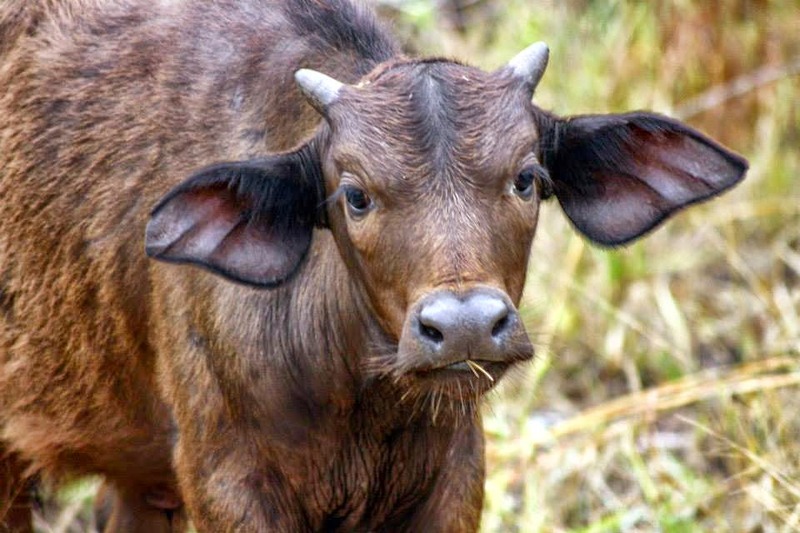 His eyes remained focused on the lifeless impala and he started to gain speed and run to the tree, without even glancing in the direction of some very angry and alert buffalo nearby. We were absolutely stunned by the scene unfolding before our eyes and somehow it was all happening so quickly…Before we knew it, the mother leopard had scattered out from behind the bushes and disappeared in a flash. 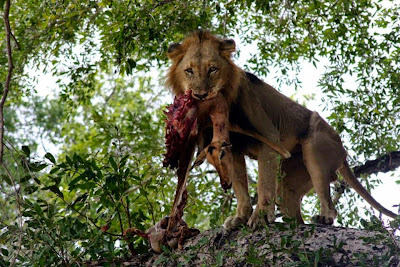 The young male shot higher up the tree and found himself balancing amoung the flimsy, thin branches, left only to watch dumbfounded as the lion clumsily climbed the tree to steal his kill. The lion struggled to keep his balance and quickly returned to the ground with the remains of the impala. He then proceeded to consume the rest of the kill, biting and chewing through the carcass in minutes, whilst the leopard remained helpless in the safety of the Jackalberry. The sighting of a lifetime! We were convinced we had seen it all and thus didn’t expect to have another unbelievable sighting but, once again, we were proven wrong… After some classic sundowners in the bush, we were on our way back to camp when one of the students spotted some eyes reflecting in the distance. We assumed it was Impala, as usual, until we approached closer...to find that it was actually a leopard! When we got close enough, we were delighted to see that it was in fact a mother leopard as well as her cub. We could not believe our luck as we followed these two leopards and watched the playful cub wander about and interact with her mother. It was a unique sighting and we spent quite a bit of time with them, enjoying observing their natural behaviour. The leopards eventually came to a water-hole where they had a drink before moving off into the night. It was such a memorable experience! After this we had another fantastic sighting of a male cheetah as well as at least fifty Marabou storks, African Fish eagles and many more! We have been extremely lucky and never take anything for granted…Today the students start with lodge placements at one of the prestigious lodges in the area where they will get the full experience of how a lodge environment works. Exciting! Another fantastic sighting of two lions doing what they do best! Once again exciting to read! Feels like im there! Keep writing...its just brilliant!